UNNES Woodball Team won a brilliant achievement in the prestigious World University Woodball Championship match in Malaysia. Vice Dean of Student Affairs of the Faculty of Sport Sciences (FIK) Dr. Taufik Hidayah MKes to unnes.ac.id from Malaysia reported that the UNNES Woodball Team successfully raised Indonesia’s flag in Malaysia by winning 2 Gold 2 Silver and 2 Bronze. Two Gold was achieved in the Stroke Competition branch. Men are in the name of Wulan Slamet Susilo, Faculty of Economics Management program (FE), Ahmad Faqih, Rifqi Najmuddin Najib (PJKR FIK), Ahmad Yopi Solpianda (IKOR-FIK), and Bagas Ardian (PKLO FIK). Then Single Stroke Man by Wulan Slamet Susilo (Indonesian-FE UNNES). 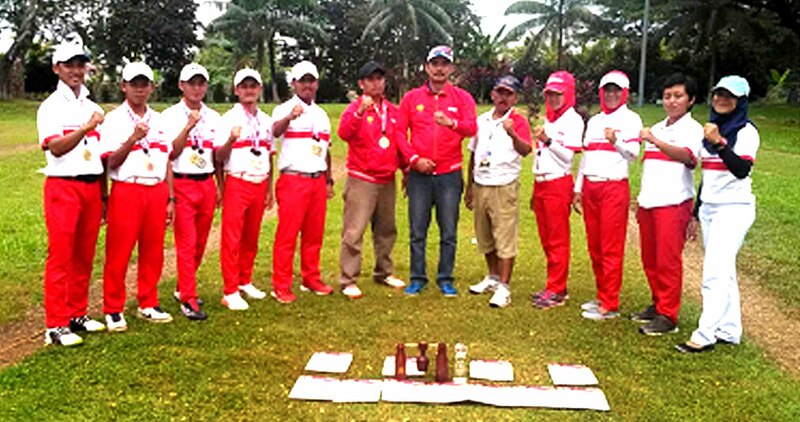 Two silver won at the Single Man Fairway Competition branch on behalf of Ahmad Yopi (IKOR-FIK). Then Ahmad Faqih (Indonesia – FIK UNNES). Meanwhile, two Bronze won at the Single Woman Fairway Comp branch in the name of Nur Rani Utami (PJKR FIK). Then Ahmad Yopi solpianda (Indonesia – FIK UNNES). Taufik explained, the 6th World Student Woodball Championship was held in Kuala Lumpur, Malaysia, from 19-24 July, the UNNES Team represented Indonesia. This championship was followed by college teams from Malaysia, Singapore, Thailand, Taipei China, Hong Kong China, China, India and Korea. UNNES rector Prof. Dr. Fathur Rokhman MHum congratulated on the outstanding achievements at this world level. “This achievement adds to the reputation of UNNES at the international level,” said Prof. Fathur.